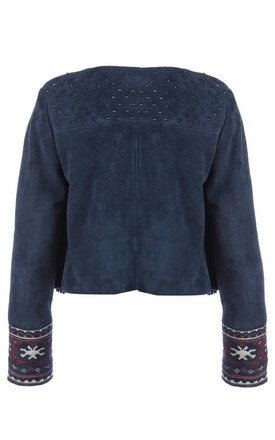 This jacket sums up the season's folk-rock aesthetic. Crafted from the softest suede, it's detailed with tiny colorful studs, embroidery and trimmed with tassel fringing at front. 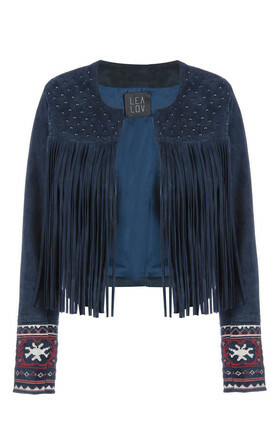 This is a real versatile piece – easy to wear in a casual denim day as well as with a dress for a glam night out. London-based label Lea Lov launched its inaugural range of luxuriously crafted outerwear and accessories in 2015. Mixing a range of technics in leather, Lea Lov’s pieces offer a spectacular expression of bold, invigorating colours, and hypnotic embroidery patterns that are layered to create playful looks.